Designer handbags are expensive, and dropping a few thousand dollars (or more) on a single bag new is something that most people aren’t willing to do. Usually, we want to have more money in the bag than how much the bag cost itself. This is where counterfeit handbags come in - not knockoffs that have a similar design as another more expensive bag, but replicas with another brand’s logos and signature embellishments. Knockoffs aren’t necessarily illegal (although unethical), while counterfeit bags have a much darker history behind them. It is illegal to sell counterfeit or replica bags in the US. What’s the harm in buying a counterfeit anyway? They’re cheaper, and they’re usually copied so well that most people couldn’t tell it apart from the real thing. First, they tarnish the reputation of brands and bring the value of designer goods down. Designers put hours and hours of work into crafting the perfect bag, and when counterfeits are made, their hard work is stolen. Even worse, the creation of counterfeits usually relies on unethical labor practices such as slavery and child labor, and subsidizes other crimes such as human trafficking, gang activity, and drug smuggling. Author Becca Risa Luna gives a good example of what buying a counterfeit bag truly means. “Imagine that a counterfeit Louis Vuitton handbag may have been stitched by a child that was taken from their parents, then the money used from the sale of it funds a terrorist purchasing weapons.” Is that $150 LV bag still worth it? Since the rise of social media, the distribution and consumption of luxury counterfeits has only skyrocketed. This is especially evident on Instagram, where there are 20,000+ accounts selling fake luxury goods from Chanel handbags to Yeezy shoes. These accounts usually look roughly the same - and feature great photography of items that look just like the goods they’re pretending to be. Instagram isn’t the only social media hotspot for fake goods; Facebook Marketplace and even Whatsapp are also contributors. Of course, social media sites shut down accounts that are selling counterfeits when they’re reported, but once one is closed, another (or more) will take its place. Counterfeits have only gotten more and more similar to the originals as time has gone on. Some distributors of fake handbags will even incorporate authentic components into fake bags, creating a Frankenstein's monster of a part real/part fake bag. Even professional authenticators have been fooled by fake bags; that’s just how good the counterfeiters have become. They pay immaculate attention to detail, and even include replicas of the dust bag and box to make the bags seem authentic. Some distributors will even go as far as to replicate tags, serial numbers, and stickers to fool consumers. So, where do we go from here? What are some ways that we as consumers can make sure that we’re purchasing an authentic designer bag? First, there’s always the age-old rule: if it’s too good to be true, it probably is. If you see someone selling a rare Chanel handbag for $150, you’re probably not paying for an actual Chanel bag. Do some research! Great resources exist online to see how much similar (real) bags are going for, such as therealreal.com. Price is the very first indicator of a fake bag, and will usually tell you if you’re paying for a Birkin or a bust. Another indicator of a fake is the feeling of the materials that it’s made of. This, of course, doesn’t work if you’re shopping online, but if you’re shopping in person, this can be a useful tool. Luxury handbags are typically made of the highest-quality leathers; hence the sky-high price. If the “leather” feels plasticy and not supple like nice leather should be, that’s a red flag. The colors on a fake can also appear blotchy and uneven, while real bags will have a flawless finish. Another easy way to spot a fake is in the logo. 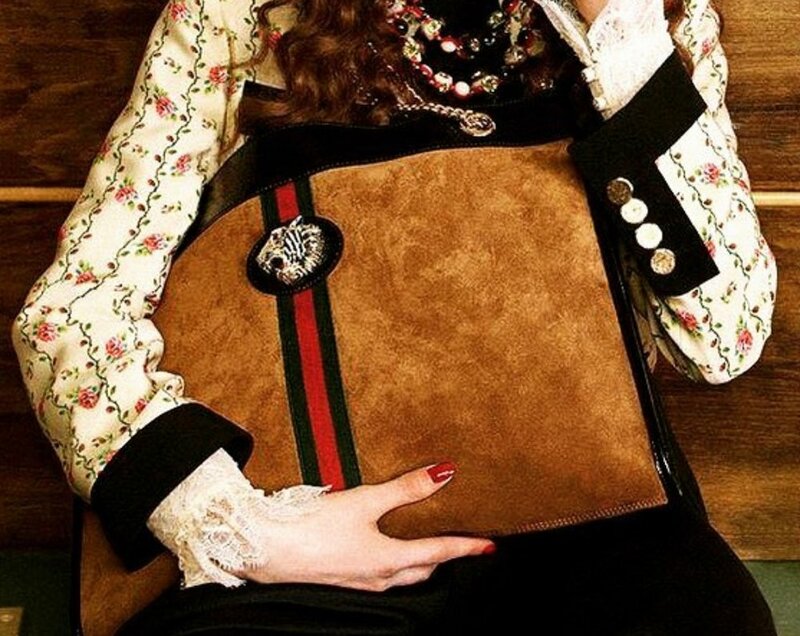 Authentic bags will have crisp, clear logos that are easily recognizable, while the counterfeits could have an obvious misspelling such as “Gocci” instead of “Gucci,” or the logo could just be blurry/fuzzy. Still, a fake bag could have a clear logo, great finish, and supple material, and still be an illegal bag. Being able to authenticate a bag takes years of experience and studying, and for the average consumer, discerning a real from a fake can be near impossible. If you’re looking to go the resale route, reputable sites such as therealreal.com (that I mentioned earlier) and fashionphile.com are some good places to start. Also, high-end consignment boutiques are great too. Usually, when people consign a luxury bag, the original tags and even receipts can still be with them - just ask the employee. Buying fakes isn’t an innocent act of just getting a good deal - it does a lot of harm, and not much good. Buying a 100% authentic bag sustains the reputation of the designer, ensures that you’re getting a quality handbag, and makes sure that the money you pay isn’t going to fund crime. Plus, you know that your bag was specially crafted - not sewn together by a child in slavery. FYI: Consign Couture authenticates each designer bag by the owner or authentication service.